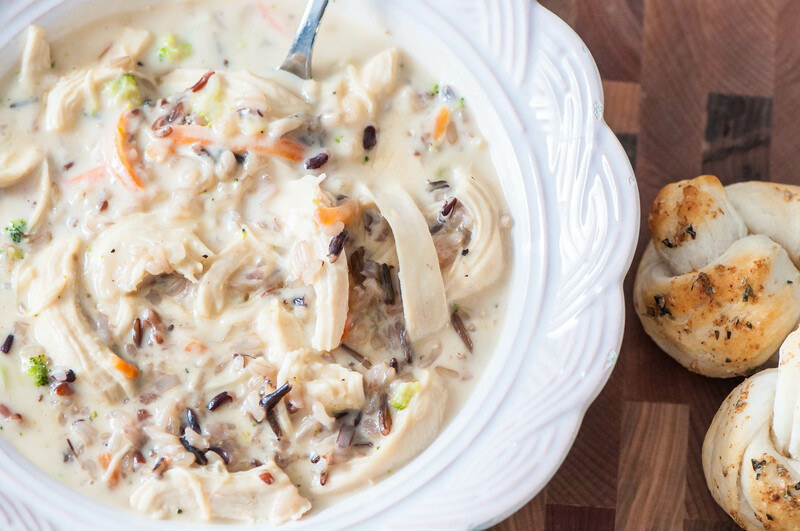 This Cheesy Chicken Wild Rice Soup is creamy, warm and hearty on these cool fall days. Shredded chicken, wild rice and veggies bulk up the lightly cheesy soup base to create the perfect dinner for your family. This weekend we celebrated Hannah’s 3rd birthday with a mermaid pool party at our local YMCA. 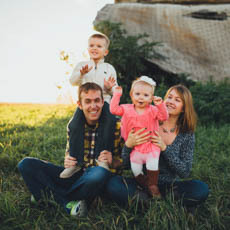 To say she had a blast would be an understatement. Every morning this past week she would wake up and ask if it was her mermaid party day so once the day was finally here so totally lived it up. That little nugget is full of so much joy, love and opinions and I just feel so dang lucky to call her mine. You know what else is amazing about my girl? She’ll eat soup with me without complaining. Those boys of mine are never pleased when they find out soup is on the menu. I don’t get it. Soup is delicious and warming and you get to dunk bread in it. What more could you want in a dinner? With all that though, 3 out of the 4 of us really enjoyed this soup. Can you guess who didn’t? Yep, the boy child. Also known as chicken hater. Also know as weirdo. This cheesy chicken wild rice soup starts with a delicious cheddar cheese sauce that is whisked into chicken stock to thin it out and lighten the base. Some of my favorite soup veggies (onions, carrots and broccoli) are sautéed and thrown into the cheese pool along with cooked shredded chicken and wild rice. The big complaint from Joel when it comes to soup is that it isn’t filling enough but with the addition of lots of chicken and rice, this soup will really fill you up and keep you full all night. Also, it doesn’t hurt to make some biscuit rolls for dunking. Just saying. If you don’t have leftover cooked chicken to use in this recipe, it’s quite simple and quick to poach a couple chicken breasts while the wild rice is cooking and that is what I did for this recipe. This is my favorite way to poach boneless skinless chicken breasts for salads, soups, sandwiches and more. Often times when chicken is poached or boiled, it can get dry and stringy but this method keeps it juicy and flavorful. It’s also nice to poach a few extra to have on hand to create easy, healthy meals throughout the week. This recipe makes a big batch which I have to admit isn’t usually exciting to me. I know I’m the exception but I’ve never been big on leftovers and try to avoid making too much of something. The leftovers rarely taste the same the next day and I don’t like eating the same thing several days in a row (I know, first world problems). This soup is a total exception to my normal rule. It tastes so delicious leftover and since I very rarely get to eat soup I don’t mind eating it throughout the week. You could also freeze the leftovers to thaw and eat on a busy night (these are my favorite freezer safe containers for leftovers). In a medium saucepan, combine the wild rice, butter and 1 3/4 cups water. Bring to a boil then lower heat to simmer, cover the saucepan and cook for 45 minutes. Add the olive oil to a large stock pot over medium heat. Add the onion and saute for 2 minutes. Add garlic, broccoli and carrots and cook for 5 minutes or until softened. Add the chicken stock and simmer for 5 minutes. Meanwhile, heat a separate sauce pan over medium heat. Melt the butter then whisk in the flour, salt and pepper. Cook for 1 to 2 minutes to cook out the flour taste. Slowly add half the milk, whisking as you pour. Let it thicken slightly then add the remaining milk. Cook, stirring often, until the mixture has thickened. Remove from the heat and stir in the shredded cheddar. Add the cheese sauce to the stock mixture and whisk thoroughly. Stir in the shredded chicken and cooked rice. Allow to simmer for 10 minutes to heat through the chicken and rice and thicken the soup a bit.